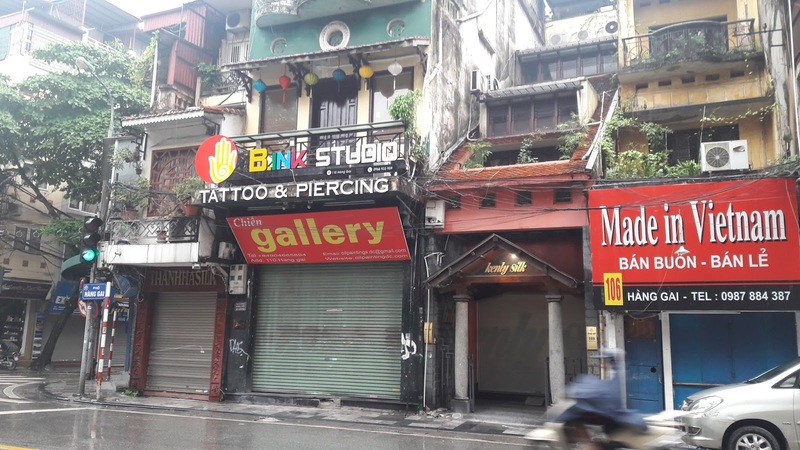 In my introductory post, I mentioned that it was in Hanoi where the seeds for ReachingDelphi were planted. And it’s in Hanoi where we meet today to say goodbye to the great 2017 we had. Hanoi is in the Northern part of Vietnam, and to be exact, Hanoi is 2784.2 KM from Kuala Lumpur. The fastest travel option from Kuala Lumpur by air and flight time is roughly 3 hours. If you have time to spare, travel by road through several ASEAN countries (Thailand, Laos) would also be an option. The drive would easily take about 39 hours, and if you have even more time on your hands and want to stay trim, then walking or cycling could also be considered — and walking would be a whopping 3,675,144 steps. No, I am not joking, many seasoned travellers have gone with these alternate options. 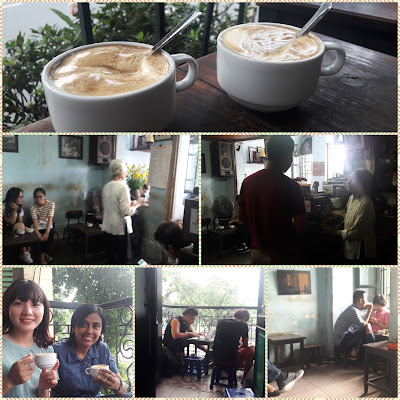 Tell me in advance, and I'll meet you at Hoan Kiem Lake for coffee. 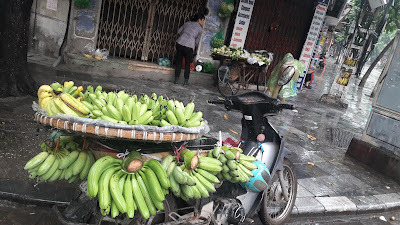 There is just too much of critical historical facts for me to condense into one paragraph — so here are just a few highlights — the history of Hanoi dates to 258BC, during the Au Lac era. 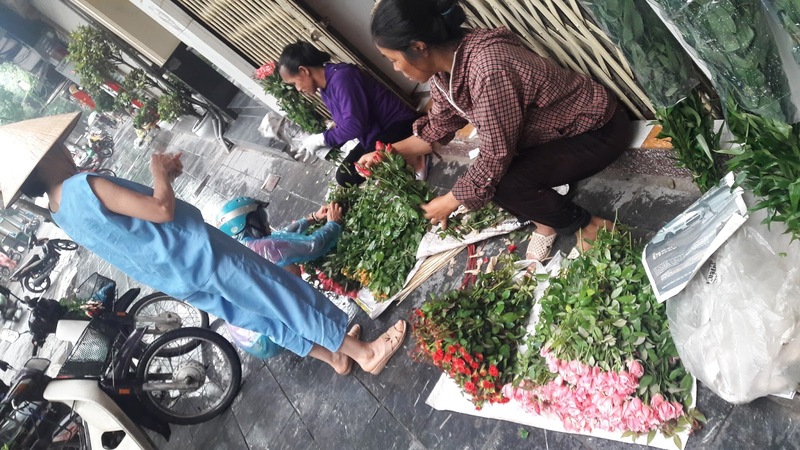 Fast-forward to more recent times, Hanoi was ruled by the French from 1887 and then was occupied by the Japanese from 1940–1945, and then was occupied again by the French in 1946 until 1954, when Hanoi became the capital of Independent North Vietnam. The French were the ones who introduced coffee to this region. Condensed enough? I hope so, I just travelled back and forth through the centuries to get you to their coffee. A famous person in Vietnamese history is Ho Chi Minh, an influential leader who led the Viet Minh Independence movement. He was the Vietnamese Communist revolutionary leader and the Prime Minister between 1945 and 1955 and the President of the Democratic Republic of Vietnam (North Vietnam) between 1945 and 1969. After the Vietnamese War in 1975 (North Vietnam won), Saigon, the former capital of the Republic of Vietnam, was renamed to Hồ Chí Minh City. The Hồ Chí Minh Museum in Hanoi is dedicated to his life and work. 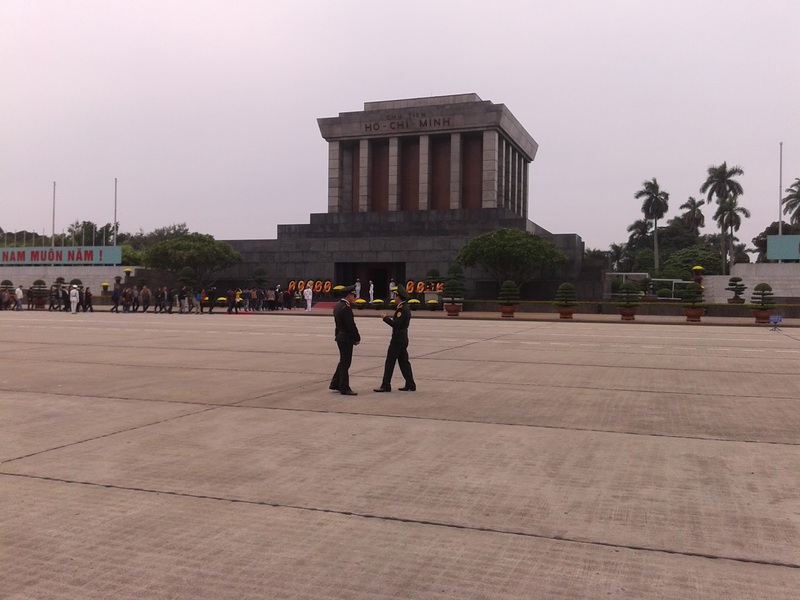 If you get a chance, do also visit the Mausoleum in Hanoi where his embalmed body is on display. The queues to the Mausoleum are long, especially on weekends and over school holidays. Hanoi, the capital of Vietnam with an estimated population of 8 million people, sits on the bank of the Red River. Here we go again, another river and this time a colourful one. The Red River is sometimes known as the Yuan River and originates from Hunan (mountains of Dali) in Southwest China and flows through the northern parts of Vietnam as it makes its way to the Gulf of Tonkin, covering 1149KM. It is known as Red River due to its heavy silt-laden water. 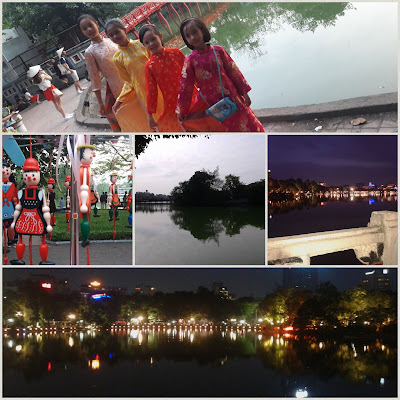 Hoan Kiem Lake is in the historical centre or what is known as the Old Quarter district. The lake surrounds the Ngoc Son Temple (a pagoda structure in the centre of a small island known as Jade Island, which is situated in the lake). According to the historical record, this temple was built in the 18th century. Around the lake are many narrow streets which today house various markets, workshops, shops, boutiques, restaurants, stalls, homes and hotels. The Old Quarter's past spans over 2000 years, but interestingly, it started as a snake-and-alligator infested swamp and evolved into villages of houses on stilts. Later in the 11th century, it gained its reputation as a crafts area where skilled craftsmen served to provide their service for the palace which was also in this area then. After filling up with some VC (Vietnamese Coffee), I started the day with a short walk to explore a little bit of the Old Quarter. It’s a wet morning, and I am sensing that I attract happy showers to this place. Okay at least I'd like to think I do, and I am saying this because it rained during most of my stay previously as well. Snap, snap, back to the Old Quarter — I love this area, the colours, smell and sight of shops, roads, livelihood, people, crowded roads, baguettes, coffee, coffee, coffee, coffee (I just can’t stop typing this word) — captures the past in the present and this is what keeps me and the many more like me, wanting to come back here for more. It’s past 6 a.m., and the sun is just about out, and so is this not-so-pleased-with-me chef. Mr Chef is late and is hurriedly preparing the Pho broth for his hungry customers. Some early customers have already started in on breakfast. 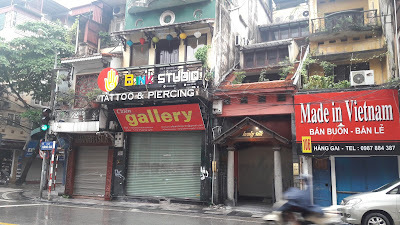 The Tattoo shop owner probably had a late night entertaining the many tourists’ requests. He is not up yet. I am in the queue, someday, some year — a dreamcatcher is on the bucket list. And as for fruits — those look really fresh. She's got the best spot, now come get me, customers! But why here — the question remains unanswered. Halong Bay is 183 km from Hanoi. If you haven’t seen a paddy field before, you’ll see plenty of them and various fruit farms along the way. 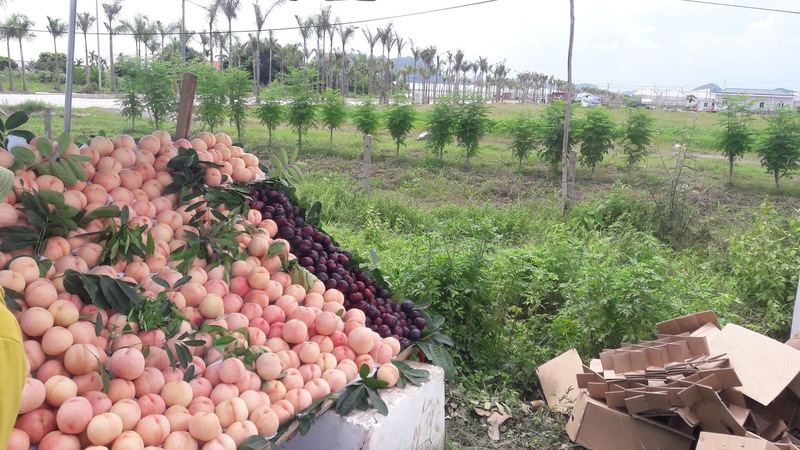 We stopped on the trip for some juicy Dao Sa Pa's – a peach variety which tasted like a cross between a peach and a mango. Approximately 4 hours later we arrived at the Paradise Lounge, where we checked in to the Paradise Cruise. 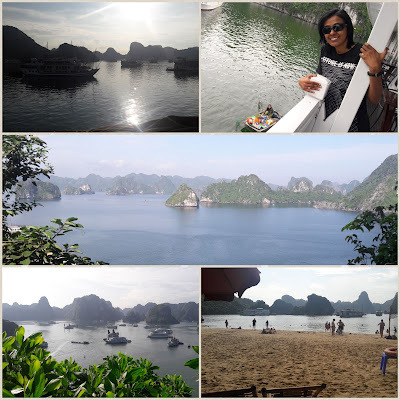 I usually do not promote any commercial names, but Paradise Tours in Hanoi and my travel consultant there (Ms Huyen) are exceptions. 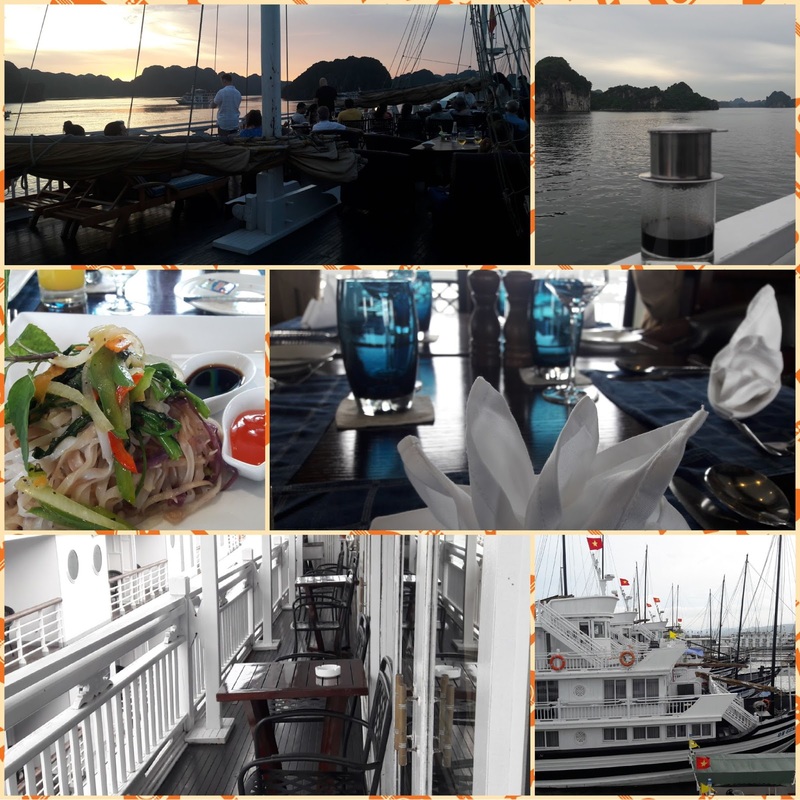 Huyen made sure we received a 5* vegetarian experience while onboard. I would recommend this cruise anytime (and again, Paradise Tours is not sponsoring this article 😉). Halong Bay is a bay with thousands of million-year-old limestone karsts and isles and is today listed as a UNESCO world heritage site. Ha Long means the Descending Dragons. According to a legend, the gods sent a family of dragons to protect this bay, and the dragons spat out jade and jewels which then turned into the tiny islands we see here today. 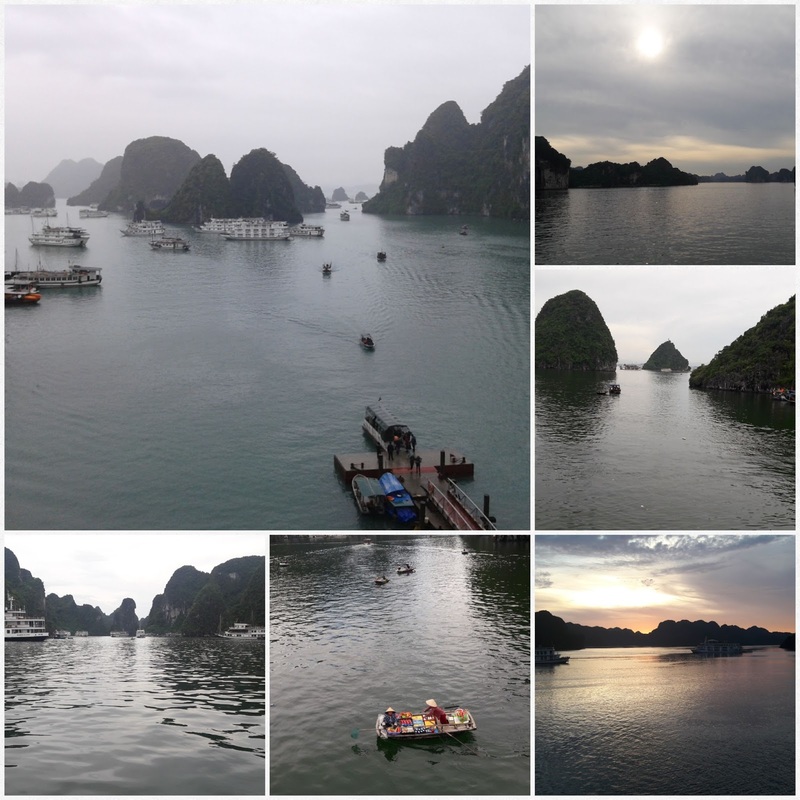 The dragons must have spat out over 1600 jewels and jades, because there are over 1600 limestone monolithic islands in this area, and we are lucky we can visit a couple of them. Hang Đầu Gỗ is the largest of them all where one can see a large formation of stalactites and stalagmites. Climb up the steps (approximately 500 of them) to get fantastic views of the bay and the natural formations inside the caves. I am climbing up to search for that dragon. There are about 1600 people (men, women, children) living in the fishing villages surrounding the bay. Some of the women in these villages operate mobile mini-market boats to sell goods to those on the cruises. We were approached by a few of them. Did you spot them and me in the pictures above? The 4-hour drive back to Hanoi has made us hungry, and it’s time for lunch. For those who love experimenting with food, the local options in Vietnam are overwhelming. I am a usually no fuss spaghetti-Napolitano person, but with my sister there, you’d be guaranteed to have different options. Minh Chay, a vegan restaurant, located in the Old Quarter, serves local vegetarian dishes, and is a must try. 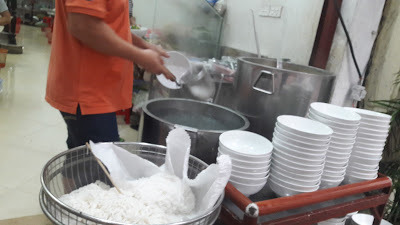 Do try that ever famous hot Pho (noodle soup) that everyone is enjoying along the sidewalks or the hot spring rolls. Mama mia, you will not go wrong. 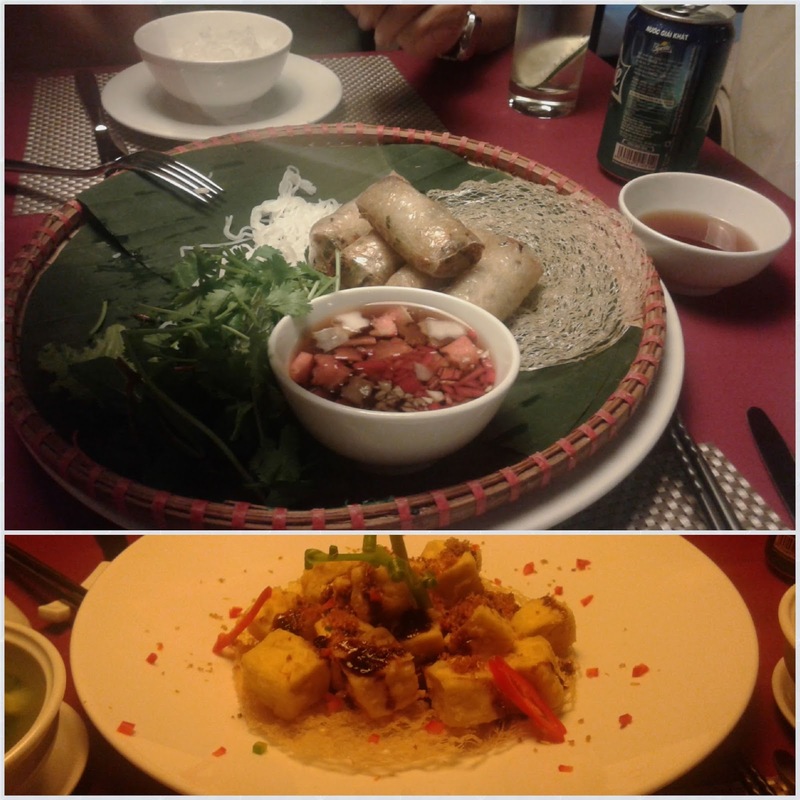 We also did a takeaway at Jalus, another vegan restaurant with western-styled preparation. I am more for local so you can guess which I liked better. 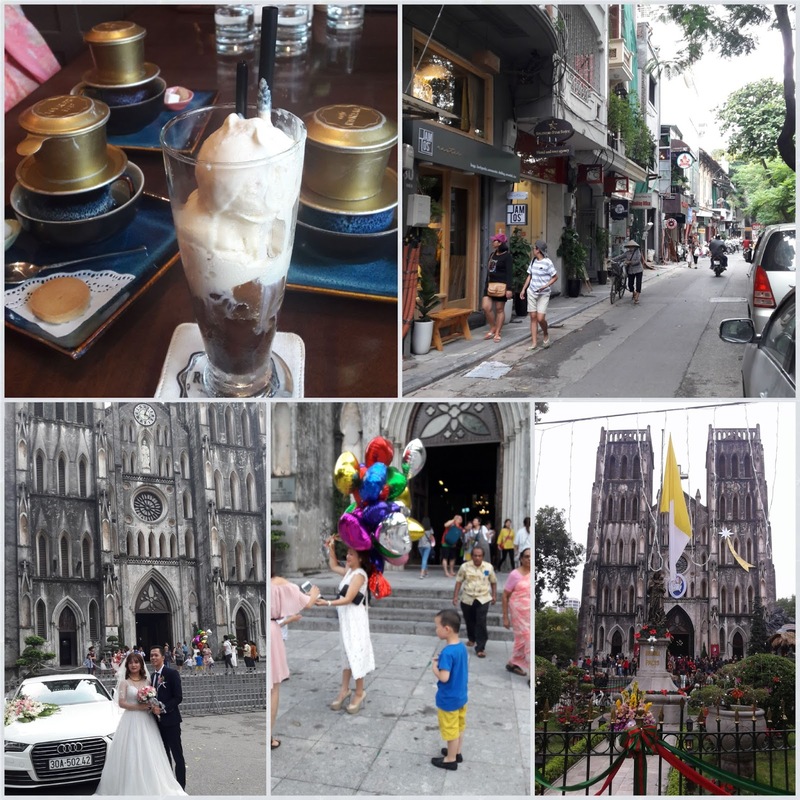 After a satisfying local meal, we headed to the west of the Hoàn Kiếm Lake in the Old Quarter district to admire the charming St. Joseph's Cathedral and here we also got to snap photos of a couple who were about to exchange their vows. They posed for us, and that is why these are posted in this blog. 👫. The cathedral is a 19th-century neo-Gothic styled church, which looks very much like Notre Dame in Paris. According to research, this was built in 1886 by a French missionary (Paul-François Puginier); the year before the French Indochina Federation was established. I later convinced my family to share my liking for VC — and the picture above tells you I succeeded in this quest. Phin coffees. Yippee, yippee, yippee and yippee! 😆😆😆😆 While they sampled hot VC served in a traditional Phin, I had a Liegeois – a Phin coffee with scoops of vanilla ice cream and whipped cream. RuNam is a quaint boutique café, in the Old Quarter district. The ambience here is great, but we had to wait a while for the order. A balcony seat will earn you a view of the famous cathedral. Was it pricey? Well, the view and ambience speak for itself. Was the coffee good? Considerably good, this was my second visit. The photo on my Google profile — well that was taken at that very balcony before the caffeine kicked in, and perhaps it’s time to change it to a less sleepy one. Coffee production has been a significant source of income for Vietnam since the French first introduced it in 1857. It is the 2nd largest coffee-producing country in the world. Of this coffee, 97% is Robusta coffee. The production of Arabica is slowly increasing. Some of the big plantations here include Trung Nguyen, Hung Phat, Tam Chau, Vietcoffee and Vinacafe. I wrote a little about the local coffee industry in my May 2017 blog post. A trip to Hanoi is not complete without catching up with my friend Thuy Le. We met the next morning at the entrance to the Ngoc Son Temple. From there we went to one of her favourite coffee shops near the lake. 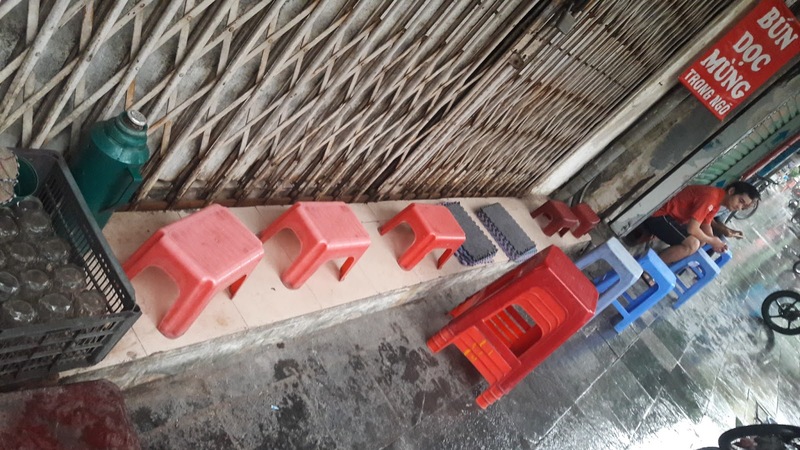 Café Dinh. Unsure if I'd like it, at the entrance she asked if the place was OK for me. I adored its warm welcome from where we stood and even more as we walked to the back, up the cemented stairs to our low tables. Café Dinh displayed an alluring character, of old in a modern and economically growing Hanoi while standing comfortably firm in its origins. It just didn’t want to be another ‘trendy’ café and, yet the place was full of respectful local customers of all generations. And guess what, we got a premium lake view while seated on the balcony, at local coffee prices. Thuy Le recommended Caphe Trung, an egg coffee, a local favourite in Hanoi. Here, egg yolk is combined with condensed milk and coffee for a warm, creamy or airy texture and served right away with some sunflower seeds on the side. Some ask if this is a pudding or really a coffee. Try it, and tell me. Café Dinh is a family owned café run by the aunt who served us the coffee. She was terribly camera shy, but you can see her in one of the photos above. Auntie showed us pictures of her younger days and of her family which hung proudly on the surrounding faded-blue walls. She was a beautiful lady then and still is, her coffee seals that statement. Thank you Thuy Le, Caphe Trung here was delicious. Merry Christmas, Ho Ho Ho. 2017 is just about to pass us by like a speed boat. A memorable year indeed, lots of events everywhere — all around the world and even in our very own backyard that have led to the decisions we have had to take. Some rosy but not all as perky as read or seen, but the sun continues to rise, and the stars continue to draw from the energy of the sun to beam brighter to guide us through the darker nights. The Law of Relativity, I'd like to think of it as. I think Uma can be a guider in Hanoi.The knowledge of her about every place of city is quite detailed. She must spend a lot time to find the information about them. 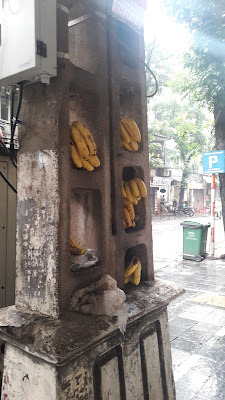 Hanoi waiting you to come back to discover more. Hi Thuy, thank you. :) Hanoi is beautiful and its a pleasure to have the opportunity to share this with others. Uma can be a guider for you in Hanoi for sure. The information about each place is detailed and quite exactly. She must spend a lot of time to find them. Hanoi waiting her to come back to discover more. U love Hanoi alot! :) I wish to go there some day.